Each video in this how to start a business online series acts as an affiliate marketing guide for beginners and experts alike. 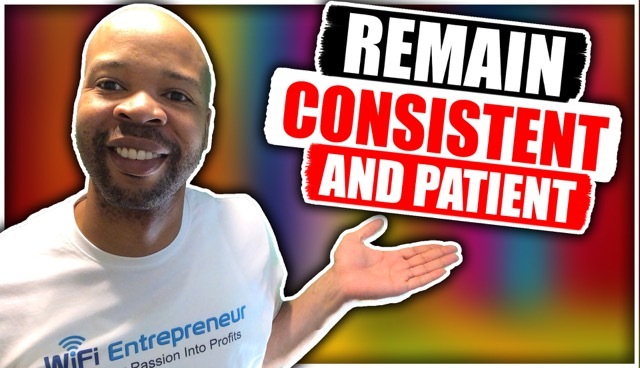 If you’re looking to grow your business online, check out this video on remaining consistent and patient, but be sure to watch the rest of the videos in this how to series when you can. What’s going on, guys? It’s Tre Mathis here from WiFiEntrepreneur.com. Here in Martha’s Vineyard, Massachusetts and it’s day three. Today is Saturday, January 12. Saturday, January 12 and this is the WiFi Journal. Like I said, it’s the third day, which is fantastic. If you guys have been following over the last few days I’ve been talking about the power of habit and building a new habit and shooting these videos and I’m really excited because today is day three, it’s the third day in a row. It’s Saturday, like I mentioned before, and I was kind of debating with myself on whether or not I should shoot a video today. Being the weekend, etc. I thought to myself well, you know maybe I could let today pass and not do anything and I started thinking to myself. I said, you know in order to really formulate a habit, you really want to remain consistent. You don’t want to begin finding excuses or reasons to take the day off, finding excuses to break your habit, because in turn, breaking your habit could also be a new habit that you’re forming. You don’t want to fall victim to that so I want to make sure that I took the time out to shoot this video. I have the buy in of my wife, of my spouse, to continue to perform these actions, which is very important. I know I have a video that either I will post. I don’t know which order I’m going to be posting these videos on, it’s a lot of old footage that we have from 2018 that never made it, but I did a video that discussed the buy in, having the support of the people around you. I remember when my wife and I first got together, when I really got passionate about this mission here with WiFi Entrepreneur, I asked her for her permission to be successful, which is very important because once I had that permission, it’s a lot of things one has to be willing to understand and accept. It’s quite interesting, quite beneficial, to get the acceptance from those individuals around you so that if you’re going away on Saturday to do videos or to work your business, your family, your spouses, your kids, etc. are understanding of such. Having their permission is very important but also one thing that I really wanted to touch on, not only … I know it’s Saturday, I really wanted to highlight that in a way because of the fact that one, you can have the excuse not to work, but being remaining consistent allows you to not only feel satisfied within yourself that you’re following your goals and seeing your goals come to fruition but the momentum, not taking a day off, is actually going to help you long term because that consistent effort can’t do anything but pay in the long run. By all means, remain consistent for sure. Another very important part of that is having patience. You know, as many of us kick off things like shooting videos and posting blogs or following any of the information that we share over at WiFiEntrepreneur.com in our community to help you build an online business, often times you find yourself maybe falling in frustration because of the fact that you think things aren’t happening as fast as you like. That’s something you have to catch yourself on because patience is very important. You have to be willing to continue to do the steps that you know are going to help you succeed. You have to go and do it with faith and understanding that it’s going to work out, but you also have to make sure that you maintain a good work ethic and a habit that allows you to see it through. With that being said, be patient. Today is day three of 2019 videos. I haven’t even posted one of these videos online yet but I’m remaining consistent in creating the content, the content that I think you guys will enjoy. I want to put it online. If this is your first time checking out one of our videos, please be sure to subscribe. If you’re on Facebook, please go ahead and follow us on WiFiEntrepreneur in our Facebook page. If you’re on YouTube, please go ahead and click the bell to subscribe and follow our content. We’re going to remain being consistent. We’re going to continue to put forth effort to help you grow your online business and to help you learn the skills necessary to succeed online and turn your passion into profit. We hope that you remain connected and if you know anyone who’s interested in making money online, please tell them about our page. Please tell them about our community. Like I mentioned before, we have over 1,000,000 online entrepreneurs talking, discussing, learning from each other all over the world and they’re all in our community and it’s free to join. If you’re not a part of that community, please go ahead and go over to our website. I’ll make sure that I put a link below. It’s free to join, you get great information, great training, an online entrepreneur certification. If you guys are interested in being online entrepreneurs, it’s a very rewarding certification that you can receive through our program. Also, we give you two free websites that you can design as you like using some of the training information that we provide you. Please go check us out and until we talk again, take care and be blessed. Next Post:How To Start A Business Online: What About Network Marketing?